Sept 10 (teleSUR) Venezuelan Foreign Minister Jorge Arreaza said Monday that “there is no humanitarian crisis in Venezuela,” but rather an “economic crisis,” as a consequence of the sanctions and the blockade exercised by sectors of the international political right against the South American nation. 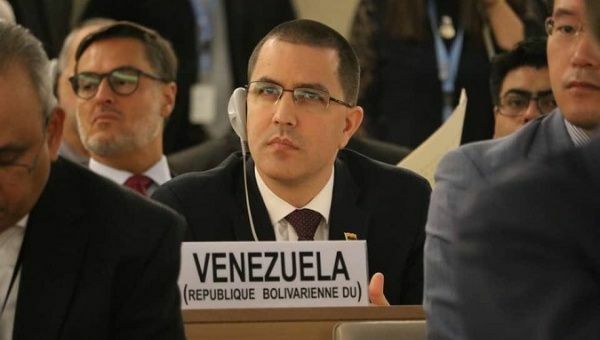 “It is greatly cynical of those who would blockade Venezuela to (then) offer humanitarian aid afterward,” Arreaza said during the 39th session of the U.N. Human Rights Council, where the situation in Venezuela was discussed, in reference to harsh sanctions against his country by the U.S. and the European Union. The diplomat’s statement corresponds to what was expressed in the report of independent expert Alfred-Maurice de Zayas during the session. “We request on behalf of the people of Venezuela and President Nicolás Maduro the cessation of aggression against the Bolivarian Republic,” said the Venezuelan foreign minister.